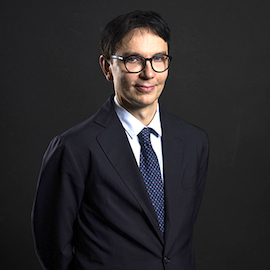 The Research Project Multiscale Innovative Materials and Structures, Years 2019-2022, which Fernando Fraternali serves as PI, has received the PRIN 2017 - PE8 GRANT (Research Projects of National Relevance, South Line) by the Italian Ministry of Education, University and Research, total grant received 816.760 Eur. The role of F. Fraternali in Mechanics Research Communications (ISSN: 0093-6413), Elsevier, has been changed to that of Associate Editor . F. Fraternali has been awarded a Position of Visting Professor at the Universite Paris Diderot (Paris, France), in the period September 03-16, 2018. The paper "Tensegrity cell mechanical metamaterial with metal rubber" has been accepted for publication in Applied Physics Letters. The paper "Tuning frequency band gaps of tensegrity mass-spring chains with local and global prestress" has been accepted for publication in the International Journal of Solids and Structures. F. Fraternali has received the "Major Contributions to Tensegrity Systems Research" Award. from the Texas A&M Laboratory on Tensegrity Systems with the following motivation: We especially wish to honor your very significant contributions to the following important acoustic problem: The speed of sound can be controlled by tensegrity structures with variable stiffness. The role of F. Fraternali in Frontiers in Materials - Mechanics of Materials (ISSN: 2296-8016), Frontiers Publishing, has been changed to that of Associate Editor . F. Fraternali gives a Plenary Lecture Dynamics and Band Gaps of Composite Metamaterials, to the 21st International Conference on Composite Structures (ICCS21), (September 4-7 2018, University of Bologna, Italy). F. Fraternali gives a Thematic Plenary Lecture On the Dynamics of Highly Nonlinear Lattice Materials, to the 9th International Conference on Computational Methods (ICCM2018), (August 6-10 2018, Rome, Italy). F. Fraternali gives a Series of Invited Lectures on the subject of Waste management by three dimensional/ four dimensional printing, to the Global Initiatives of Academic Networks, Ministry of Human Resource Development, Government of India (18-22 December 2017, Guru Nanak Dev Engineering College, Ludhiana, India). The XXIII AIMETA Conference (AIMETA 2017) , organized with the support of the University of Salerno, will be held at the Grand Hotel Salerno from Sept. 04 thru Sept. 07, 2017. Within AIMETA 2017, Antonino Favata, Luciano Feo, Fernando Fraternali, Andrea Micheletti and Robert E. Skelton announce the Minisymposium Innovative lattice materials and structures (MS04). F. Fraternali gives a Plenary Lecture On the mechanics and engineering of composite lattices, to the 3rd International Conference on Mechanics of Composites (MECHCOMP3), (July 4-7 2017, School of Engineering and Architecture, University of Bologna, Italy). 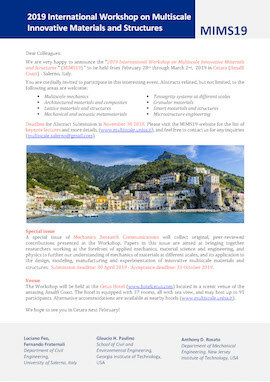 Fernando Fraternali, Luciano Feo and Robert E. Skelton announce the 2016 International Workshop on Multiscale Innovative Materials and Structures (MIMS16) to be held on October 28-30, 2018 in Cetara (Salerno). F. Fraternali has been appointed as Associate Editor of Ingegneria Sismica - International Journal of Earthquake Engineering (ISSN: 0393-1420), Patron Editore. 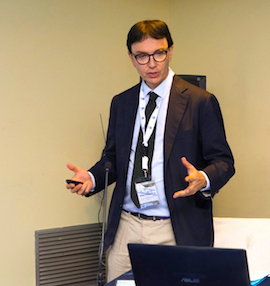 F. Fraternali gives an invited seminar on the Innovative Materials, Structures and Algorithms for Energy Efficient Buildings, Department of Civil Engineering, Universite' de Pau et des Pays de l'Adour, France, May 19, 2015. 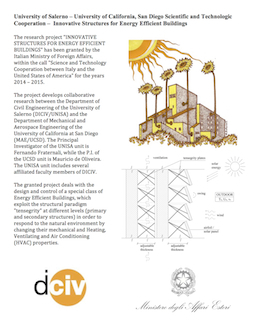 The collaborative research project between the University of Salerno and the INNOVATIVE STRUCTURES FOR ENERGY EFFICIENT BUILDINGS has been granted by the Italian Ministry of Foreign Affairs for the year 2015 (2nd year, PIs Fernando Fraternali and Mauricio de Oliveira). F. Fraternali gives an invited seminar on the Wave Dynamics of Innovative Nonlinear Lattices, to the Colloquium Series "Nonlinear Analysis", University of Augsburg, Germany, Dec. 04, 2014. F. Fraternali gives an invited seminar on the Multiscale Variational Modeling and Characterization of Materials and Structures, to the Department of Civil Engineering, KU Leuven, Belgium, Dec. 02 2014. Ada Amendola has been appointed as Visiting Scholar at the Mercury Centre for Advanced Manufacturing Technology & Production University of Sheffield, UK. The paper DIRECTIONAL WAVE PROPAGATION IN A HIGHLY NONLINEAR SQUARE PACKING OF SPHERES, A. Leonard, F. Fraternali, C. Daraio, EXPERIMENTAL MECHANICS , 53(3), 327-337, 2013 has received the 2015 HETENYI AWARD. F. Fraternali has been appointed to the Editorial Board of Frontiers in Materials (ISSN: 2296-8016), Frontiers Publishing. F. Fraternali has been appointed to the Editorial Advisory Board of Curved and Layered Structures (ISSN: 2353-7396), De Gruyter Open. Gerardo Carpentieri has been appointed as Visiting Scholar at the Department of Mechanical and Aerospace Engineering, University of California, San Diego, USA. The special issue of Mechanics Research Communications MULTI-SCALE MODELING AND CHARACTERIZATION OF INNOVATIVE MATERIALS AND STRUCTURES, Edited by Fernando Fraternali and Anthony D. Rosato, has been published into VOLUME 58, 2014 (www.multiscale.unisa.it). Fernando Fraternali is Professor of Structural Mechanics in the Department of Civil Engineering at the University of Salerno (Diciv), Italy. He received his B.Sc. 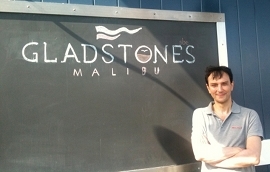 and M.Sc. degrees in Civil and Environmental Engineering from the University of Salerno, and a Ph.D. in Multiscale Mechanics from King's College London. F. Fraternali has participated as a PI or co-PI in various research projects funded by the Italian National Research Council, the Ministry of Education, the Ministry of Foreign Affairs (Italy-USA scientific cooperation), and US research agencies. Prof. Fernando Fraternali is Delegate to Research and Doctorate Affairs at Diciv. 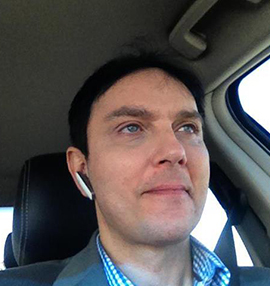 Most of his research work concerns multiscale modeling and simulation of solids and structures, and the design and engineering of innovative and sustainable materials at multiple scales. 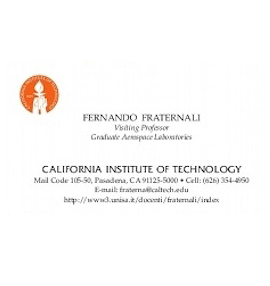 Prof. Fraternali was awarded a Fulbright Research Scholarship for the academic year 2005/06 and has been Visiting Professor at the Graduate Aerospace Laboratories of the California Institute of Technology since September 2005 (several periods), and the Department of Mechanical and Aerospace Engineering, University of California, San Diego, USA, from August 2012 through to the present. Recently, he received the "Major Contributions to Tensegrity Systems Research" Award from the Texas A&M Laboratory on Tensegrity Systems (April 2018); the "Bdr2017 Award - Category Green Economy" for the University of Salerno spin-off Newmatt, (founder and CEO) within the Startup Competition on Innovation and Entrepreneurship "Borsa della Ricerca 2017" (Fisciano, May 2017); the "2015 Hetenyi Award" from the Society for Experimental Mechanics, Inc. (Bethel, CT 06801, USA; June 2014); the "Contributions to the Variational Theory of Fracture" Award from the Vibration and Wave Propagation Laboratory of the Georgia Institute of Technology (Sept. 2012); and the "Contributions to Understanding the Behavior of Waves in Granular Systems" Award from the Granular Science Laboratory of the New Jersey Institute of Technology (Aug. 2012). Prof. Fraternali is Associate Editor of Mechanics Research Communications (Elsevier, ISSN: 0093-6413), Frontiers in Materials (Frontiers Publishing, ISSN: 2296-8016) and Ingegneria Sismica - International Journal of Earthquake Engineering (Patron Editore, ISSN: 0393-1420). He is also on the Editorial Advisory Board of Curved and Layered Structures (De Gruyter Open, ISSN: 2353-7396), and Science and Engineering of Composite Materials (De Gruyter Open, ISSN: 2191-0359). F. Fraternali is Guest Editor of the following special issues: "Multi-Scale Modeling and Characterization of Innovative Materials and Structures", Mechanics Research Communications (Volume 58, Pages 1-156, June 2014); "Composite Lattices and Multiscale Innovative Materials and Structures", Composites Part B: Engineering (Volume 115, Pages 1-504, April 2017); and the research topic "Multiscale lattices and composite materials: Optimal design, modeling and characterization", Frontiers in Materials, in press. Fernando Fraternali e' Professore Ordinario di Scienza delle Costruzioni nel Dipartimento di Ingegneria Civile della Universita' degli Studi di Salerno (Diciv), a partire dal 02.05.2016. Ha ricevuto la laurea in Ingegneria Civile per la Difesa del Suolo e la Pianificazione Territoriale con lode dalla Universita' degli Studi di Salerno (laurea quinquennale) ed il PhD in "Multiscale Mechanics" presso il King's College di Londra. Nell'Universita' di Salerno ha precedentemente ricoperto il ruolo di Professore Associato e Ricercatore Universitario per il settore 08/B2 Scienza delle Costruzioni ed e' attualmente Delegato alla Ricerca ed al Dottorato del Diciv. E' autore di un vasto numero di memorie scientifiche pubblicate su riviste a diffusione internazionale, in atti di convegni, monografie e rapporti interni. Ha partecipato a diversi progetti di ricerca finanziati dal MIUR, dal CNR, dalla Rete dei Laboratori di Ingegneria Sismica (RELUIS), dalla Regione Campania, dal Ministero degli Affari Esteri (Cooperazione Scientifico-Tecnologica Italia-USA) e da Agenzia di Ricerca degli Stati Uniti. Le sue attivita' di ricerca presenti e passate hanno riguardato principalmente la modellazione multiscala della risposta meccanica dei materiali e delle strutture; la progettazione, l'analisi e la sperimentazione di materiali e strutture innovative; la dinamica non lineare e la dinamica sismica delle strutture; l'ottimizzazione strutturale e la meccanica delle strutture non resistenti a trazione. F. Fraternali ha goduto di una borsa di studio Fulbright per la categoria "Research Scholar" nell'Anno Accademico 2005/2006 ed e' stato "Visiting Associate in Aeronautics" presso il "California Institute of Technology" (Pasadena, USA), dal Settembre 2005 al Febbraio 2009 (in congedo sabbatico dall'Universita' di Salerno negli anni accademici 2005/2006 e 2006/2007). 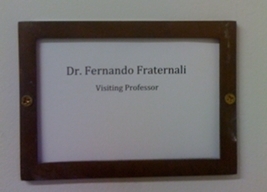 Nel periodo da Agosto a Dicembre 2012 e' stato "Visiting Academic Scholar" presso il "Department of Mechanical and Aerospace Engineering" della "University of California, San Diego", USA. Nel 1991 ha visitato anche il "Department of Engineering Science and Mechanics" del "Virginia Polytechnic Institute and State University" (Blacksburg, USA). Recentemente ha ricevuto il Premio "Major Contributions to Tensegrity Systems Research" dal Laboratorio "Tensegrity Systems" della Texas A&M University, USA (Aprile 2018); il "Bdr2017 Award - Categoria Green Economy" per lo spin-off dell'Universita' di Salerno Newmatt, (fondatore e CEO) nell'ambito della Startup Competition su Ricerca ed Impresa "Borsa della Ricerca 2017" (Fisciano, Maggio 2017); il "2015 Hetenyi Award" dalla Society for Experimental Mechanics, Inc. (Bethel, CT 06801, USA; Giugno 2014); il premio "Contributions to the Variational Theory of Fracture" dal Vibration and Wave Propagation Laboratory del Georgia Institute of Technology (Settembre 2012); ed il Premio "Contributions to Understanding the Behavior of Waves in Granular Systems" dal Granular Science Laboratory del New Jersey Institute of Technology (Agosto 2012). Fa parte del Board of Editors delle seguenti riviste scientifiche a diffusione internazionale: "Mechanics Research Communications" (Elsevier, ISSN: 0093-6413); "Frontiers in Materials" (Frontiers Publishing, ISSN: 2296-8016); "Curved and Layered Structures" (De Gruyter Open, ISSN: 2353-7396); Ingegneria Sismica - International Journal of Earthquake Engineering (Patron Editore, ISSN: 0393-1420) ed il "World Journal of Engineering" (Emerald Publishing, ISSN: 1708-5284). Il Prof. Fraternali � Associate Editor delle riviste scientifiche a diffusione internazionale Mechanics Research Communications (Elsevier, ISSN: 0093-6413), Frontiers in Materials (Frontiers Publishing, ISSN: 2296-8016) ed Ingegneria Sismica - International Journal of Earthquake Engineering (Patron Editore, ISSN: 0393-1420). E' inoltre nell�Editorial Advisory Board delle riviste Curved and Layered Structures (De Gruyter Open, ISSN: 2353-7396) e Science and Engineering of Composite Materials (De Gruyter Open, ISSN: 2191-0359). F. Fraternali e' Guest Editor delle seguenti special issues: "Multi-Scale Modeling and Characterization of Innovative Materials and Structures", Mechanics Research Communications (Volume 58, Pagine 1-156, Giugno2014); "Composite Lattices and Multiscale Innovative Materials and Structures", Composites Part B: Engineering (Volume 115, Pagine 1-504, Aprile 2017); e del research topic "Multiscale lattices and composite materials: Optimal design, modeling and characterization", Frontiers in Materials, in corso di stampa. Seismic design of structures. Collapse spectra. Development and assessment of mechanical theories of laminated composite structures. Effects of moderately large rotations and bimodular material behavior. Local-global stability analysis and post buckling response. Mechanical models of FRP-reinforced structures. Modeling of delamination effects. Service life and failure behavior. Experimental validation. Interlaminar stress measurement. Design and experimentation of junctions for FRP reinforcements. Delamination tests on composite beams. Testing of real scale models of FRP-reinforced structures. Failure test of reinforced concrete beams strengthened with FRP plates and wrappings. Construction, instrumentation, testing and modeling of a FRP-reinforced pavilion vault in masonry bricks. Stress measurement through instrumented bricks. From discrete to continuum variational methods in computational mechanics. Unilateral materials and structures (no-tension/no-compression materials and structures). Structural optimization via variational methods and evolutionary strategies. Free discontinuity models in fracture mechanics. Buckling tests of thin-walled cylinders and tubes. Crack tracking in elastic and no-tension structures. Collaboration with Michael Ortiz's research group, the Solid Dynamics group of the Center for the Simulation of the Dynamic Response of Materials (ASC), and the Caltech's Center for Advanced Computing Research (CACR). Formulation of constitutive models for the dynamics of polymers and soft biological tissue. Variational multiscale models for fracture and fragmentation of brittle and cohesive materials. Dynamics, damage and fragmentation of composite structures under blast and ballistic loadings. Simulation of traumatic head injuries. Prediction of mechanical and physiological damage to brain tissue. Collaboration with Chiara Daraio's research group on the mechanical and numerical modeling of strongly nonlinear phononic crystals. Multiscale analysis of wave propagation in granular materials. Study of solitary wave propagation, anomalous wave reflections, shock disintegration, tunability of wave properties. Particle methods for the numerical analysis of granular systems. Design of optimal composite granular protectors and granular band-gap materials by computation. Use of solitary waves for non-destructive evaluation. Multiscale mechanical modeling of nanostructures composed of carbon nanotube foams and polymeric films. Study of strain localization, dynamic instability on the micro scale and rate-independent hysteresis on the macro scale. 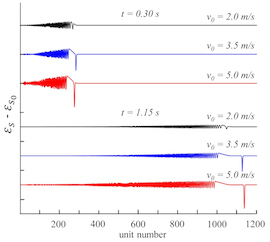 Analysis of the Gamma-convergence of proposed models and their validation against experimental results on compression tests in statics and dynamics. Collaboration with Robert Skelton and Vitali Nesterenko research groups. 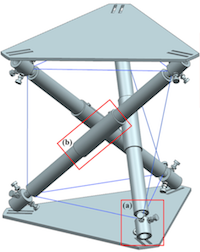 Building and testing of real-scale models of tensegrity structures. 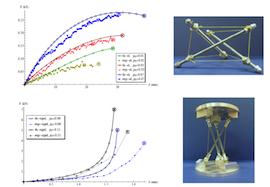 Optimal design of minimum mass tensegrity structures with parametric architecture. Innovative structures for energy efficient buildings. 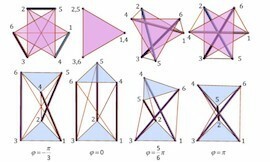 Computational design and experimentation of soft tensegrity metamaterials. Collaboration with Chiara Daraio's research group on the design and engineering of acoustic metamaterials based on granular materials and tensegrity lattices. Modeling and testing of carbon nanotube structures and hierarchical materials. Tensegrity actuators and sensors. Collaborations with Conny Rodenburg and Russel Goodall. Plasma irradiation and particle mask treatments to enhance the surface roughness of polymeric materials. 3D printing of periodic lattices based on tensegrity structures and shape memory metals. 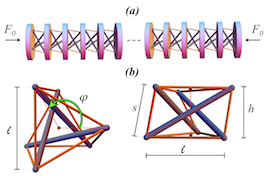 Tensegrity modeling of the spider silk. Modeling and characterization of reinforcin elements for engineering materials with fractal architecture. Characterization of the mechanical behavior of brain tissue. Measurement of regional and directional mechanical properties of brain pig specimens through tensile tests. Development of constitutive models of brain tissue. Construction of a finite element model of the human head from MRI and CT scans. Validation against laboratory data. Simulations of traumatic brain injuries. Head injury criteria. Experimentation of honeycomb materials and foams for use as dissipative fillers in head protection devices. Falling weight impact tests. Multiscale models of biomembranes and nanostructures, with applications to the red blood cell membrane and carbon nanotube assemblies. Variational multiscale approach. Continuum limits of the interaction potentials acting at the microscopic scale. Modeling of membrane networks as point particles interacting via harmonic and dihedral potentials. Modeling of carbon nanotube structures as chains of nanoparticles interacting via bistable spring potentials. In situ characterization of the mechanical properties of biomembranes and carbon nanotube structures. Development of mechanical models of laminated composite shells.